KSRealityBites: Cardiac Surgery successfully done! MANGALORE: A male of aged 54 who is an agriculturist from Mulki, was admitted at Fr Muller Medical College Hospital on April 1. He was having the complaint of chest pain & general weakness. On thorough clinical examination, he was diagnosed with the rupture in his great aorta resulting in leakage of blood & his aortic valve in a state of leaking condition. The aorta is the largest blood vessel that supplies blood to the entire body. The patient was referred to Dr. Prabhakar, the chief interventional cardiologist took the challenge of saving his life & he told that the patient was admitted in a critical condition which needed an emergency surgery to save the life. The hospital administrator Fr Richard Coelho explained the surgery performed was one among the rare surgeries that had been so far done at India. 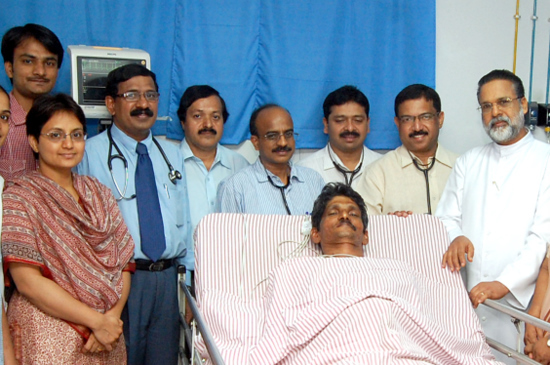 A team of doctors was formed, comprising Dr. A.G. Jayakrishnan, the chief cardiac surgeon, Dr.K.T.Anand,Dr. K.Sayed, Dr.Usha Rao & Dr. Chetana Anand. The team was lead by Dr. H.Prabhakar. The team of doctors took four hours to complete the surgery by repairing & replacing the valve & by grafting the aorta. The patient is now recovering & he is expected to be discharged within 2 days-says Dr.Prabhakar. Father Muller Charitable Institutions director Fr Patrick Rodrigues has congratulated the team of doctors on their unique achievement & for saving the life of the patient.